Nicholas Demellis received his Masters Degree as a Nurse Practitioner , with honors, from South University in Tampa. He did diverse clinical rotations in Miami and Tampa, Florida. As a Board Certified Family Nurse Practitioner, Nicholas is experienced in treating a wide range of healthcare disorders that revolve around the family unit. Including promotion of a healthy lifestyle, disease prevention, providing direct care and counseling for patients of any and all ages. Nicholas is fluent in Greek, Portuguese, and competent in Spanish. 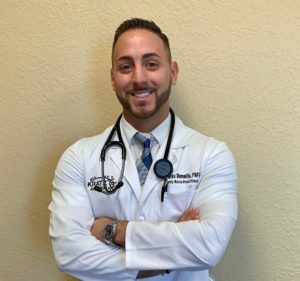 He completed diverse clinical rotations in Miami. He is currently working on his doctorate in nursing.